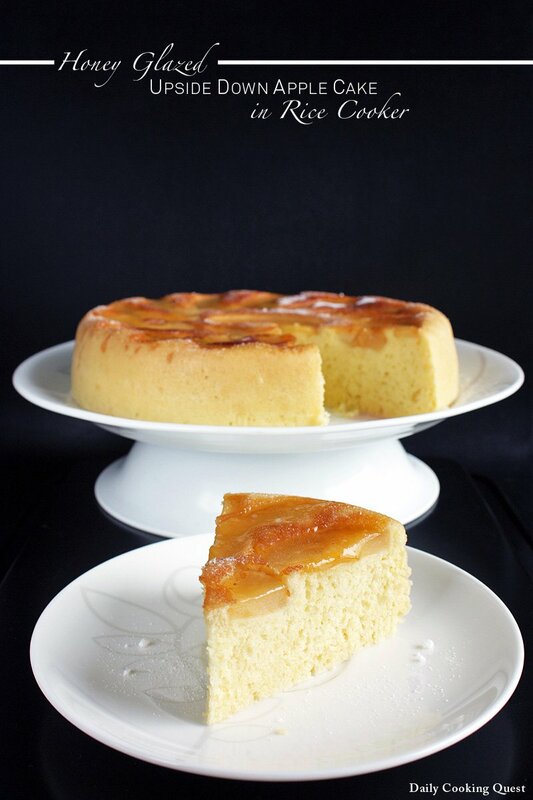 If I love my previous upside down apple cake in rice cooker, then I am just absolutely head over heels for this one. I think the decision to slightly cook the apple in cinnamon and honey prior to “baking” it in the rice cooker is a good call. And the fact that I whip my egg whites to a medium peak before combining with the rest of the ingredients really makes this a super light and airy cake. Even though my arm aches a bit from whipping the egg whites, the effort is totally worth it. 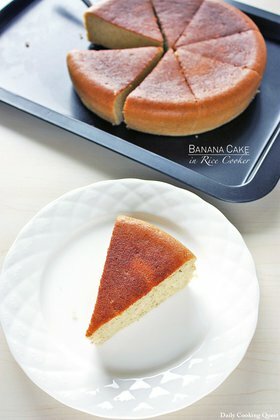 The cake is very soft, very moist, and it rises beautifully to a full two inches height in my basic 10 cup rice cooker pot. Plus, I got to use the leftover juices from cooking the apple to glaze the cake, giving the impressive glossy look and making sure the cake stays moist even the day after. Peel and core the apple, cut into 16 sections. Place the apple, cinnamon stick, and honey on a pan and cook on low heat until bubbles. Once apple is softer but stiff firm, turn off the heat and set aside so the apples have some time to soak up in the yummy juice while you continue with your cake preparation. 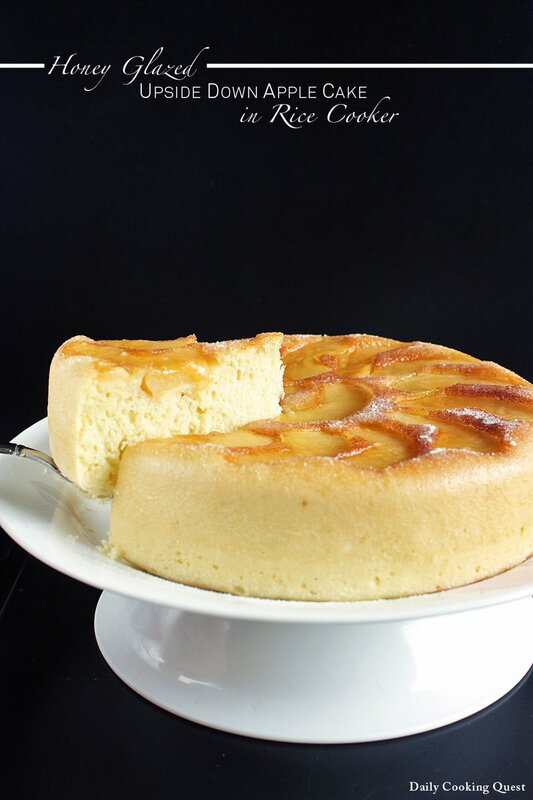 Place the apple sections in the bottom of your rice cooker pot, and reserve the cooking liquid to glace the cake. Pour the batter into the pot to completely cover the apples. Lightly brush the top of the cake with the reserved liquid from cooking the apples. This will give the cake a glossy look, and more importantly, it will stay moist even the day after (if it lasts that long). creative use of the rice cooker. looks yummy! 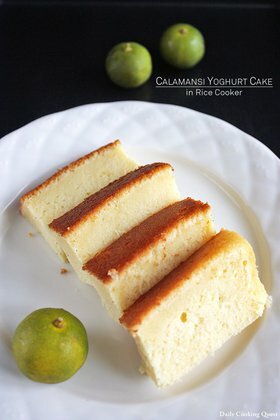 Hi, Can i substitute all purpose flour with cake flour? if can, the measurement will be same as 1 cup of cake flour too? Great recipe! And a lifesaver since I have no idea how to bake in my oven due to the fact all the labels are in Japanese and there are no instructions.t The cake was quite tasty. However, it's more dense and moist like a pudding than a cake. 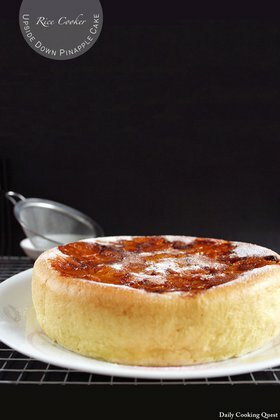 Hi Anita, may I know what is the total time required for cooking the cake?Since the cook to warm timing may varies for different brand of rice cooker, can I just set a time for the cake to cook continuously? Thanks for the info. I'll use the congee/soup function which cook continuously for an hour. Going to try it today. Will update if it works. An update to my 1st trial on this recipe. 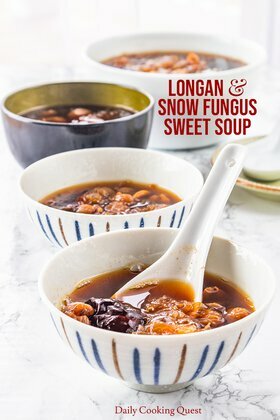 I cooked 1hr using congee function instead of 40mins as recommended. I was worried that the cake may not cook thoroughly in shorter time since my rice cooker was 6 cups capacity. The cake surface turned to be too brown. Hi Anita, Can I use cinnamon powder instead? You can Monica, but the apple will have ground cinnamon's chocolate specks. Oh, and please use 1/2 teaspoon ground cinnamon. My first attempt turned out to be dry. Any suggestions? That makes sense! I may have done the cooking too long. But to solve the issue I put honey on top. My family devoured it. Thank you! Thank you for this recipe! I substituted the milk with oat milk as I’m lactose intolerant. I found it to be quite dense, like sticky pudding, but it was still yummy :) Cheers from Denmark!